This easy vegetarian chili is made with beans, fire roasted tomatoes, peppers, and adobo sauce. It's healthy, make-ahead friendly, and delicious! Even though I live in Austin, I didn’t grow up with deep-rooted Texas chili traditions, so for authenticity’s sake, I’m just going to call this one Hinsdale Chili. What’s Hinsdale chili you ask? It’s the delicious vegetarian chili you get from the Whole Foods in Hinsdale, Illinois, when it’s 5 degrees outside and you’re on your way to the airport. In that moment (last week), it was everything I wanted and needed – a hot bowl of stewy tomato, black bean & chickpea-y goodness. I craved it again the next day, so I recreated this easy vegetarian chili recipe using (mostly) items from my pantry. This recipe is low-fuss, and it’s perfect for those nights when you want something simple, quick, and comforting! Heat olive oil in a pot and sauté the onion for 5 to 8 minutes. Add the rest of the ingredients, stir, cover, and simmer for 25 minutes. Season to taste and serve! You can top your chili however you like – I topped Jack’s bowl with grated cheese and mine with diced avocado. This recipe makes about 4 servings, but you could easily double it and freeze some for later. This easy vegetarian chili is made with black beans, chickpeas, roasted tomatoes, peppers, and adobo sauce. Healthy, make-ahead friendly, and delicious! Heat the oil in a large pot over medium heat. Add the onion, a few pinches of salt and pepper, and stir. Cook until the onion is slightly translucent, and then add the garlic and green pepper. Stir and cook until soft, 5 to 8 minutes, turning the heat down as needed. Add the tomatoes, black beans, kidney beans, chipotles, adobo sauce, corn, salt, and a few grinds of pepper. Cover, reduce the heat to low, and simmer for 25 minutes, stirring occasionally. If the chili becomes too thick, add water as needed. Stir in the lime juice and season to taste with more salt and pepper, as desired. *Chipotle peppers can vary in spice level. If you’re sensitive to spice, start with less. If you love spice, add more to taste. If you’ve made your chili too spicy, add more lime juice and a bit of olive oil to tone it down. I’m not a big chili fan but this looks good! I did grow up in Texas with chili, but I’m not too conventional so I like your version. 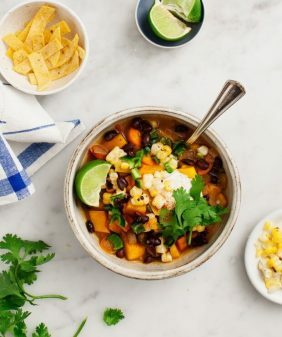 😉 Black bean chili is one of my favorite cold weather dishes to make and I always enjoy it most with tangy and smoky chipotle in adobo. I’ve not put chickpeas in it before though, but I like this addition. This sounds delicious, and perfectly comforting. I love meals, like this, that take a bunch of ordinary ingredients that I always have in my pantry and creates something wonderful. I’ve been looking for a new chili recipe and this might be just the one to try out this week! 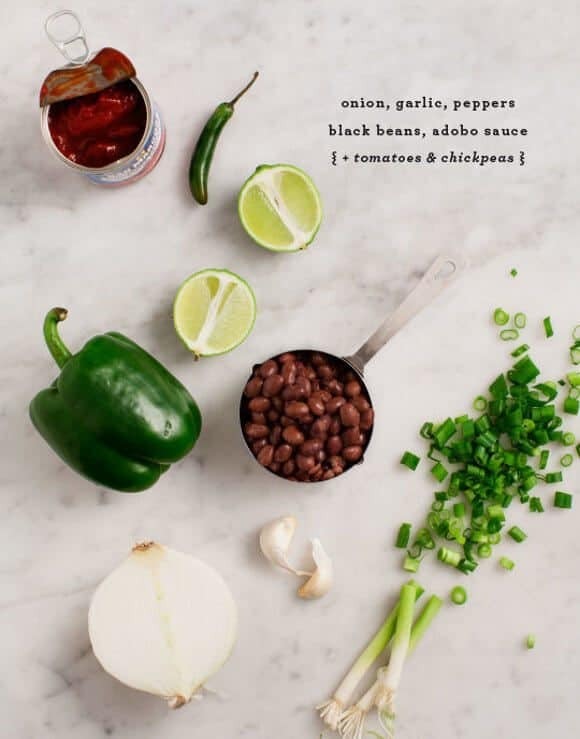 This looks yummy…I’m no chili expert either but I’m always looking for recipes for it. 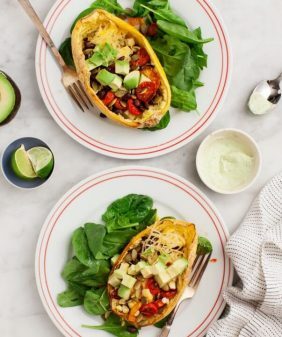 My husband really likes it, but he prefers healthier options so this might be a hit! Looking forward to trying it! 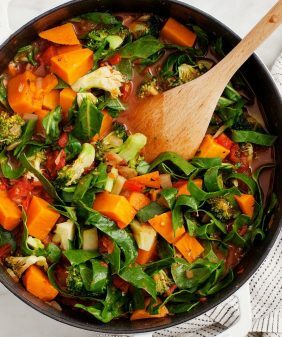 This looks wonderful, hearty and delicious Jeanine! My mom always put chickpeas in chili. This is traditional to me. Your recipe looks great. Thanks! I’m definitely not a chilli snob! This looks awesome! This looks simple yet delicious. Definitely worth a try one busy weeknight! This would be a great recipe to sub any kind of beans for! I prefer chickpeas raw, but swapping them for white or red beans would be great. I love it when you have something so good that you just have to recreate it the next night. Those are the best meals! Excited to try making this in my own kitchen. Perfect for getting me through the rest of winter! Hahaha I have hit up that Hinsdale Whole Foods a time or two on the way into the city from the burbs! Small world. It’s so cold here still! And I’m being a baby because most Chicagoans think 30 is warm ha! This bowl of goodness will keep me and my belly warm! Ha, I know all about how 30 feels “warm” :). I sure don’t miss those winters! I’m so excited to try this recipe. So delicious! So inspirational! I absolutely love your site and your food. It is such an inspiration for me and what I do. As another native Texan (no longer living there though), I appreciate you bringing your take on food to the culture…I know how hard that can be. What are your thoughts about adapting this kind if chili for the crockpot? Hi Brian, I don’t do a lot of crockpot cooking so I’m really not sure. Maybe someone else in this comment thread will have some suggestions? This looks so yummy and perfect for the grey weather outside!! Can’t wait to try it! This looks so delicious and so healthy.. I also love the ingredients, definitely try this! This sounds sooo good! If anything, it does when paired to such a freezing cold! Although it is nowhere near Illinois weather where I am (yay 50 Fº Italy!!) I am definitely pinning it for later. I hope adobo powder can be a good replacement for the sauce. thanks Valentina 🙂 Adobo powder should work (I would just add it to taste – 2 tablespoons might be too much). Chickpeas are so good for you, this is a great idea. Looks delicious! i just had a chili party over the weekend for the foodball games. this recipe looks so good! I love simple but meaningful recipes. thanks for sharing! 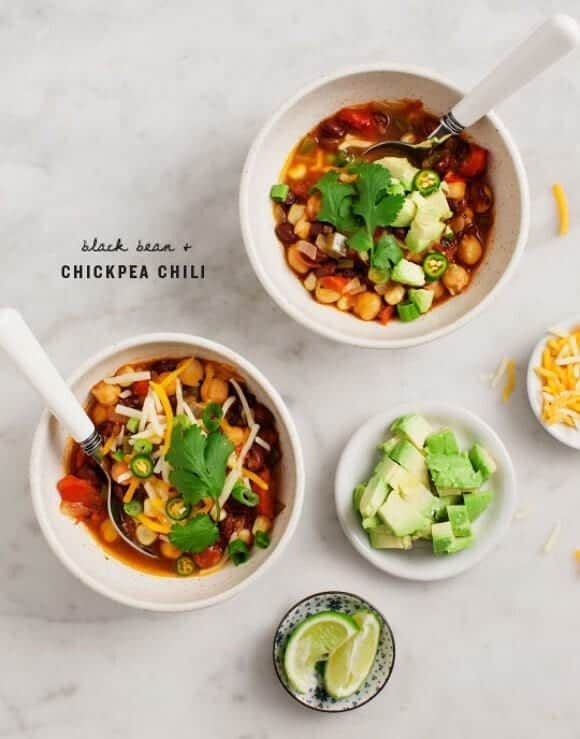 I love Chili and this sounds simply delicious! I can hardly wait to try this chickpea chili!!! It looks fabulous and so many other things on your blog do too! thanks Caryn, let me know if you give it a try! Made this tonight for dinner and even my v. picky father made it through a bowl! So hearty, great flavor, perfectly spicy. I’ll certainly return to this recipe! 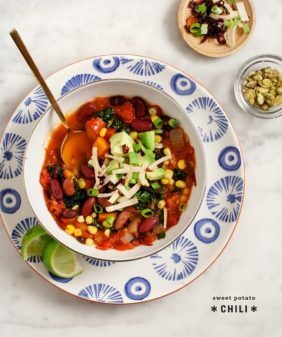 Oh my goodness, for the past few years I’ve been wondering how to re-create Whole Foods’ veggie chili (an Illinois resident, I know the exact black bean, chickpea and stew-ey goodness of which you speak!) I think the missing ingredient was the adobo sauce. 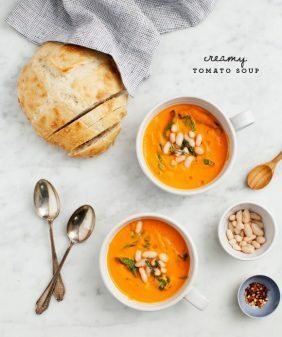 Thanks so much for the recipe — can;t wait to make this! your pictures look amazing. May I ask for your camera/ settings/ light etc? Maybe you can share some ideas. Thanks. Happy cooking. Made this tonight and it was a hit! 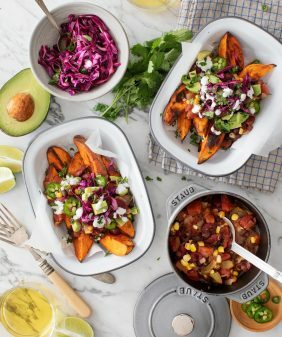 I’ve been using a tweaked version of your sweet potato chili for some time now so this recipe is a nice change up. My boyfriend even went back for seconds and he was skeptical of meatless chili. So thank you! I did add a teaspoon or two of cumin because we like a little more heat. Seemed to work out great. Ha, I’m so glad you liked it!! Interesting about the adobo – I usually have almost more sauce than actual peppers – do you mind if I ask what brand you used? Oh man! haha I don’t remember the brand but I could check again the next time I go to Publix…. but I just googled it and by the pictures of cans I think it was Embasa LOL 😛 It was chuck full of peppers! I made this tonight and the consistency was much more like a soup than a chili. I’m surprised no one else mentioned this. I turned up the heat at the end but next time I would definitely reduce the amount of water. The flavor was nice though. Hi Catherine – thanks for the feedback – you’re the second to mention, so I’ll reduce the water a little bit in the notes since it’s always easier to add more if things get thick. I made this for my mother (who eats meat – I do not) and she totally loved it! She said that she didn’t miss the meat at all! It was perfectly spicy and so warm and yummy on a chilly evening! This is definitely my new easy go to recipe. Since you first posted this recipe, it has become a staple in my house, and my go-to crowd-pleaser dish at a potluck. It is, quite simply, the best vegetarian/vegan chilli. WOW. Had cans of black beans and chickpeas to use up and after a quick Google search this heavenly solution landed right in my lap. Extremely simple, (fool-proof for an amateur in the kitchen like me!) incredible flavor! I added a roasted poblano pepper to the mix and some chipotle seasoning. Absolute perfection. Hi Ellen – I’m so glad you liked it!! Do you think this recipe could be applied to a crock pot? Hi Madeline – yep, I think it would be great in a slow cooker. One reader (a few comments above) said 2-3 hours in her crockpot was perfect. Just made this soup! So delicious. I really like the flavor of the adobo sauce. I added a teaspoon or two of cumin because it just doesn’t feel like chili without cumin 🙂 in my opinion. Thank you for the delicious and easy recipe! Hi Jeanine! You mention kidney beans in the instructions, but not in the ingredient list – can you clarify whether that extra can of beans is needed? Thanks! Oops, thanks for pointing that out! Made this soup for dinner tonight. It came out delish! I added some tortilla chips as toppings, yum!